Shahrukh Khan’s Fan opens in the Chicago area on April 15, 2016. The highly meta film features Khan in two roles: as a superstar actor and as an obsessed fan. I can’t exactly say that it looks good, but I’m sure it will be interesting. Fan opens on Friday in nine local theaters: AMC River East 21 in Chicago, Regal Gardens Stadium 1-6 in Skokie, Century 12 Evanston in Evanston, MovieMax Cinemas in Niles, Muvico Rosemont 18 in Rosemont, AMC South Barrington 30 in South Barrington, Marcus Addison Cinema in Addison, Regal Cantera Stadium 17 in Warrenville, and AMC Loews Woodridge 18 in Woodridge. It has a listed runtime of 2 hrs. 22 min. In other exciting news, the South Barrington 30 is showing Friday’s new Hollywood release The Jungle Book twice daily with its Hindi audio, featuring the voices of Priyanka Chopra, Irrfan Khan, and Nana Patekar. Ki and Ka gets a third week at MovieMax, South Barrington 30, and Cantera 17. All three theaters also hold over Kapoor & Sons, as does the Woodridge 18. This entry was posted in Weekly Theater Updates and tagged 2016, Addison, April 15, Bloomingdale, Bollywood, Chicago, Evanston, Fan, Friday, Hindi, Indian, Kapoor & Sons, Ki and Ka, Malayalam, Movie, Niles, Rosemont, Runtime, Shahrukh Khan, Skokie, South Barrington, Tamil, Telugu, The Jungle Book, Trailer, Warrenville, Woodridge on April 14, 2016 by Kathy. It’s hard to find a more reliable Bollywood star in North America than Shahrukh Khan. It’s been over a decade since he last had a theatrical release that earned less than $1 million in the United States and Canada — 2003’s Chalte Chalte. Here’s a chart representing the total North American gross for each of 24 films featuring Khan in a starring role, going back to 1999 (the earliest year for which I can find reliable data). What’s so remarkable about Khan’s success is that it predates the era of super-wide releases. His two most recent films — Dilwale and Happy New Year — opened in 290 and 280 North American theaters, respectively. Yet 2003’s Kal Ho Naa Ho made almost $2 million on just 52 screens! The lowest earning film on this list — 2000’s Josh — opened in just 30 theaters but still made $426,318. Another great bit of news for exhibitors is that Khan’s films always open well. Khan’s median opening weekend per-screen average is around $9,000, compared to an overall median PSA for Bollywood films in North America in the $2,000s. High theater counts have hardly put a dent in that average, with Chennai Express averaging $12,327 on 196 screens in 2013. Those consistently high averages only tell part of the story, though. The two movies on the list with the lowest opening weekend PSAs are Chak De India and Swades — $5,675 and $5,740, respectively — arguably two of Khan’s most beloved films (at least compared to more financially successful ventures like Don 2 and Ra.One). Fan marks yet another collaboration between Shahrukh Khan and Yash Raj Films. The five other YRF movies on this list — Mohabbatein, Veer-Zaara, Chak De India, Rab Ne Bana Di Jodi, and Jab Tak Hai Jaan — averaged total North American earnings of $2,051,086. It’ll be interesting to see if Fan raises that average even more. This entry was posted in Box Office and tagged Bollywood, Bollywood Box Office, box office, Box Office Analysis, Earnings, Hindi, Indian, Movie, Shahrukh Khan on April 13, 2016 by Kathy. Kabhi Khushi Kabhie Gham… (“Sometimes Happiness, Sometimes Sadness“) may not be the best movie ever, but it certainly is the most movie ever. Those able to embrace the film’s excesses are rewarded with non-stop entertainment. From the outset, K3G (the film’s popular nickname) establishes familial love as its theme. The movie opens with a wealthy man, Yash Raichand (Amitabh Bachchan), talking about the particular affection a father feels for his child. Yash’s wife, Nandini (Jaya Bachchan), stresses the unconditional nature of motherly love. They smile as they talk about their pride and joy: their son, Rahul (Shahrukh Khan). Cut to a portrait of the happy family. Wait, who’s that other kid in the picture? The one they didn’t bother to mention? It’s their younger son, Rohan, who is a complete afterthought in his parents’ eyes. Yash and Nandini adopted Rahul as a baby, after having trouble conceiving. When Nandini unexpectedly became pregnant with Rohan nine years later, they continued to focus all of their parental affection on Rahul, leaving young Rohan to make due with hugs from the Raichand family maid, Daijan (Farida Jalal). Yet when Rahul is disowned for falling for a working-class gal named Anjali (Kajol), it falls on poor Rohan to try to reunite his family. He does so willingly, despite being the acknowledged second-favorite of his parents’ two kids. Fortunately, the years spent carrying that chip on his shoulder have molded adult Rohan into an Adonis, played by Hrithik Roshan. He takes his prep school education and sleeveless shirts and heads to England to find his estranged brother. Rohan’s quest is aided by his former childhood nemesis: Anjali’s younger sister, Pooja (Kareena Kapoor). The minute grown up Pooja is introduced, everyone else in K3G ceases to matter, because Kapoor’s fabulousness outshines them all. Adult Pooja is the queen bee of her college, sneering at the girls and smugly brushing off the boys she deems too lowly for her to date. She’s so damned popular that she can go by the nickname “Poo” without people laughing in her face. Her wardrobe is made up exclusively of hotpants, fur shrugs, and tops that are basically a cocktail napkin held in place by a shoelace. It cannot be overstated how amazing Poo is. Everything she does is over the top. No character has every been as bratty yet lovable. Kapoor commits to Poo’s outrageousness, and the results are hilarious. London is where the character relationships in K3G are at their best. Shahrukh and Kajol are even more charming as a married couple then they are in the early stages of Rahul and Anjali’s relationship. Rahul and Poo banter sweetly as he acts as her protective older brother. Poo’s romantic advances toward Rohan are as funny as his rebuffs. There are a couple of negative aspects to K3G. First is the incessant fat-shaming of young Rohan (Kavish Majmudar). Young Rahul (played by Shahrukh Khan’s son, Aryan) calls his little brother “fat” in every conversation he has with Rohan as a boy. Other members of the household join in, too, as do young Pooja and her pint-sized cronies. When adult Rahul realizes that the hunky guy who’s been living with him under false pretenses is his long-lost brother, the first thing he asks Rohan is how he lost so much weight. Then there’s the creepy relationship between patriarch Yash and Naina (Rani Mukerji), the woman he’s chosen for Rahul to marry. Naina is all kinds of fabulous, in her sparkly backless dresses and midriff-baring tops. Yash is way too touchy-feely with Naina, and she only makes it worse by singing a sultry, Marilyn Monroe-style rendition of “Happy Birthday” to her would-be father-in-law. Yet all can be forgiven thanks to the movie’s endearing absurdity, including a song that features Shahrukh dancing in front of the pyramids while sporting see-though shirts, and then pawing at Kajol while wearing various all-leather outfits. When characters aren’t celebrating, they are crying. There is so much celebrating, so much crying, and you just have to roll with the whole experience. Keep that mindset throughout Kabhi Khushi Kabhie Gham… and you are guaranteed a great time. This entry was posted in Reviews and tagged 3.5 Stars, Amitabh Bachchan, Bollywood, Farida Jalal, Hindi, Hrithik Roshan, Indian, Jaya Bachchan, K3G, Kabhi Khushi Kabhie Gham, Kajol, Karan Johar, Kareena Kapoor Khan, Kavish Majumdar, Movie Review, Rani Mukerji, Shahrukh Khan, Sometimes Happiness Sometimes Saddness, Suraj Hua Maddham on October 20, 2015 by Kathy. Dhanak (“Rainbow“) is as charming as can be, a sweet fairy tale about a blind boy and his devoted sister. The deserts of Rajasthan provide the perfect setting for writer-director Nagesh Kukunoor’s story of faith, family, and the general goodness of mankind. 8-year-old Chotu (Krrish Chhabria) and his 10-year-old sister Pari (Hetal Gada) are orphans, living in a tiny village with their aunt and uncle. Aunty (Gulfam Khan) is a classic “wicked stepmother,” stingy and resentful of having to raise children who aren’t her own. Uncle Durgaram (Vipin Sharma) loves Pari and Chotu, but he’s a stoner who won’t stand up to his domineering wife. Chotu and Pari are movie buffs who spin tales about their celluloid heroes: Chotu’s idol, Salman Khan, and Pari’s imaginary boyfriend, Shahrukh Khan. Outside of the town movie hall, Pari spies Shahrukh on a poster for a vision charity. The Shahrukh of her stories is noble and generous, so Pari believes he’s the man who can restore Chotu’s sight. The village buzzes with news that Shahrukh is filming in nearby Jaisalmer (nearby being relative, since Jaisalmer is 300 kilometers away). When Uncle Durgaram won’t take them to ask Shahrukh for his help, Pari and Chotu put on their flip-flops and begin the long walk to Jaisalmer alone. They receive a considerable amount of help on their journey, getting lifts from friendly truck drivers and guests heading to a wedding. The kids are so guileless that most adults are eager to help, without trying to dissuade them from their mission. Dhanak‘s rural setting — with smalls town separated by miles of sand dunes — is the perfect venue for telling the kind of story that no longer seems possible in the West. Given the omnipresence of technology that allows parents to be in constant contact with their children at all times, it’s refreshing to see a movie where the kids are the decision makers. They receive adult assistance, not interference. That’s not to say that the world Pari and Chotu live in is perfectly safe. They encounter dangers, often from unlikely suspects. Then again, how safe were they at home, with their cruel aunt and spineless uncle? Since Dhanak is for kids as much as it is about them, the dangers Pari and Chotu face aren’t depicted in detail. The film is totally family friendly, and realistic without being scary. Just as the kids are occasionally betrayed by figures of authority, they are encouraged to choose their allies based on more than first impressions. One of the sweetest relationships in the film is between the kids and Badrinath (Suresh Menon), a former truck driver mad with grief over the deaths of his own children. Their need allows him to regain some of what he’s lost, even for a short time. A kindly grandmother tells Pari and Chotu that there is magic in the world, and they just have to reach out and grab it. Whether or not magic exists as an independent force in the film is debatable. Yet the kids’ journey teaches them that there is kindness and friendship to be found in the world, and that those forces are sometimes enough to make dreams come true. This entry was posted in Reviews and tagged 2015, 3.5 Stars, Bollywood, Dhanak, Gulfam Khan, Hetal Gada, Hindi, Indian, Krrish Chhabria, Movie Review, Nagesh Kukunoor, Rainbow, Salman Khan, Shahrukh Khan, Suresh Menon, Vipin Sharma on September 30, 2015 by Kathy. I updated my list of Bollywood movies on Netflix with two new additions to the catalog that are sure to delight Shahrukh Khan fans. The classic Kabhi Khushi Kabhie Gham is now available for streaming, as is 1997’s Pardes. For everything else new to Netflix, check Instant Watcher. 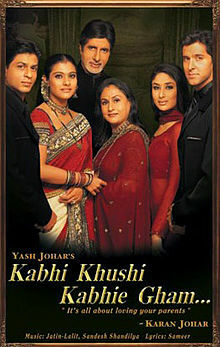 This entry was posted in Streaming Video and tagged Bollywood, Bollywood Movies on Netflix, Desi Movies on Netflix, Hindi, Hindi Movies on Netflix, Indian, Indian Movies on Netflix, Kabhi Khushi Kabhie Gham, Movie, Netflix, Netflix Instant Indian Movies, Pardes, Shahrukh Khan on August 26, 2015 by Kathy. Happy New Year got off to a roaring start in its first weekend in North American theaters. From October 24-26, 2014 — plus some Thursday night preview showings — Happy New Year earned $2,076,873 from 280 theaters ($7,417 average per screen). That’s the biggest opening weekend performance of the year by a wide margin over second place Bang Bang, which earned $1,410,383 from 292 theaters. However, Happy New Year‘s opening weekend earnings fall short of Shahrukh Khan’s biggest ever opening weekend in the United States and Canada. That honor goes to last year’s Chennai Express — also co-starring Deepika Padukone — which earned $2,416,213 from 196 theaters. 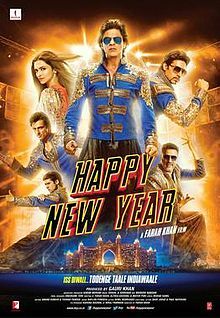 Among the three films Khan and Padukone have starred in together, Happy New Year ranks third in terms of per-screen average in North America. Its $7,417 ranks behind Chennai Express ($12,328) which ranks behind 2007’s Om Shanti Om ($15,474). Yet Happy New Year‘s average is still high enough to rank third for this year, behind only The Lunchbox and 2 States. This entry was posted in Box Office and tagged 2014, Bang Bang, Bollywood, Bollywood Box Office, box office, Chennai Express, Deepika Padukone, Earnings, Haider, Happy New Year, Hindi, Indian, Movie, October 24-26, Om Shanti Om, Shahrukh Khan, The Lunchbox on October 27, 2014 by Kathy.